Around 38 per cent or more than a third of candidates put up by the four major parties of Maharashtra for the state’s 48 Lok Sabha seats are hereditary politicians. As many as 34 candidates put up by Congress, NCP, Shiv Sena and BJP have a father, uncle, husband or father-in-law who has served either as an MLA or MP and were instrumental in launching the political careers of these candidates. The BJP also has a very high percentage of dynasts. The party is contesting on 25 seats. Of the 23 candidates it has announced so far, nine come from political dynasties. It is yet to make a formal announcement of candidates for two seats. Interestingly, the Madha seat again is set to go to Ranjitsingh Naik Nimbalkar, who hails from a political family of the region. Seven of Shiv Sena’s 23 Lok Sabha candidates are dynasts. 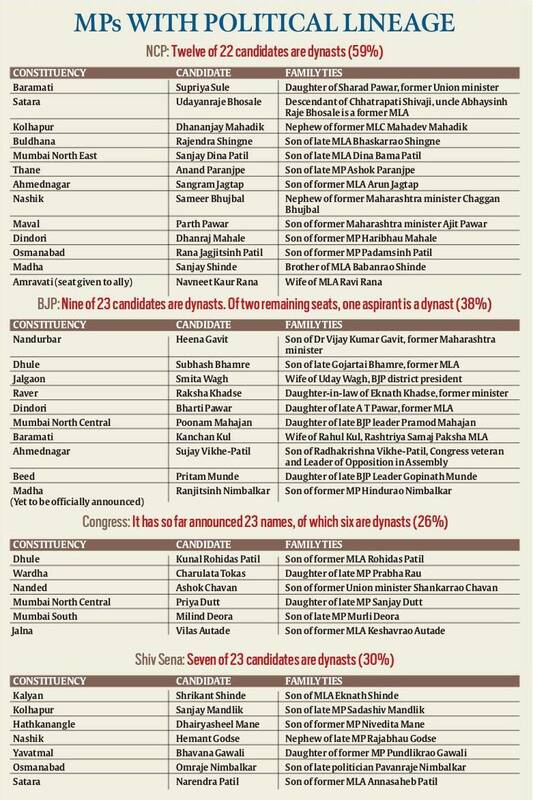 The Congress, which is a punching bag on this issue, has so far announced 23 candidates, of which six are dynasts. It is yet to name the candidate for Pune and has allotted Sangli and Palghar seat to allies. While parties cry hoarse about the need to eliminate nepotism and bring fresh faces into politics, Maharashtra’s political reality appears stacked against youngsters without family connections who hope to fight elections. Political dynasties are a global reality and a common feature in most of the world’s democracies. Arguments in favour of such dynasties range from stating that these raise efficiency and also tend to create a degree of cohesiveness among legislators, which could improve efficiency of functioning. Hereditary politicians also argue that unlike other legacy professions such as law, medicine or the running of businesses, they have to submit themselves to the electoral test every five years. The case against it is that it does not allow outsiders in easily, leads to the concentration of political power in a few families, and leads to corruption. Globally, however, there is no empirically proven study that hereditary politics leads to bad politics.